8" grip, 24" blade; total length 32"
Heading out to the Colosseum? Should be interesting. You never know what's going to happen in the high walls of the stately stone stadiums. Who are you going to fight? What weapons will they be using? Maybe you'll even come up against a hungry lion or ostrich (Yep, ostriches were actually introduced into the arena every so often). Well, to be honest, most gladiators probably had their specialty. Lions weren't simply hoisted on an unsuspected fighter because it would be a waste of well-trained resources and not a very good show for the thousands of paying spectators. Other specialties included men who battled from chariots, warriors that used two swords, and even fighters that defended themselves with a net and a trident. So if you're looking to top off your gladiator costume, you'll have to choose a weapon. 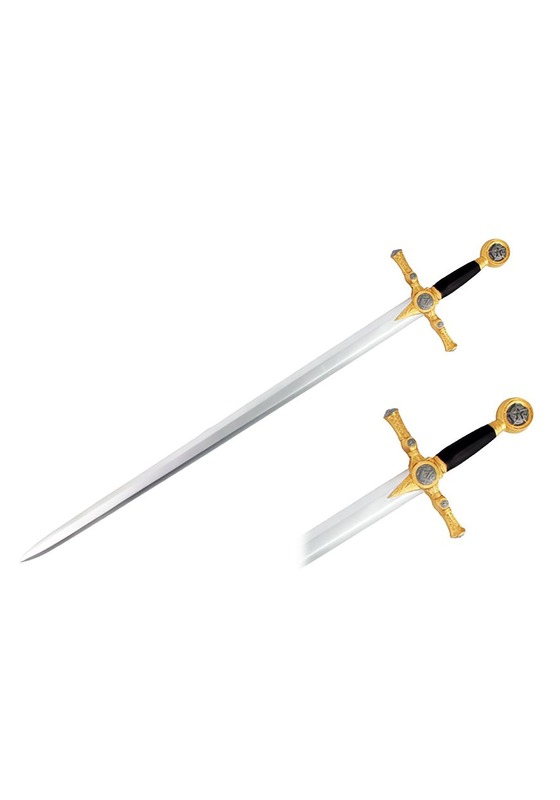 Any gladiator would be impressed with the graceful design of this sword. It has a flat black blade with a line down the middle. The handle has a sharp curve on the top and the bottom and has a gold base. It's made of foam with a plastic exterior and is thirty-two inches long. The color scheme goes well with many of our gladiator costumes. When you're dressing as a Roman gladiator, you might as well go all out. Gladiators look awesome in gold, feathers, and red fabric cloaks. This lightweight sword will look perfect with many of these costumes. After all, what's that saying? While in Rome!